Don’t go cold on your water and get the best water heater for your RV! Traveling a lot on your RV means that you need your hot water up and running. 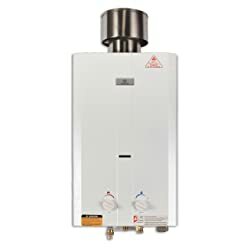 We have made a selection of the best electric and gas water heaters so that you don’t have to worry about it. The Eccotemp L10 is a highly portable, compact and lightweight water heater that will keep you up on your water-heating game for a while. With so many features to look at, this is the best choice of water heater for your RV. Rugged design made to last. The great thing about this is that it can effectively heat water and give you a more trusted experience. We like the fact that the product is powered by a 20-lb propane gas tank which saves energy like you don’t know. All that ruggedness and sturdiness has to come with a price. The one thing that we dislike the most is that it is pretty heavy. But this only adds to the durability and should not be an issue when it comes to installing on your RV. When you come in contact with this water heater, the first thing that you notice is its rugged design. Not surprisingly, it is designed to last for a long time and withstand any weather mishap that you might face. The engine works with propane and is capable of delivering hot water at a flow of 2.6 GPM. As you see, this is perfect for all your hot water needs inside your RV. It works on a standard 20-lb liquid propane tank and the ignition is powered by 2 “D” cell batteries, making it a great addition to your on-the-go gear. The water heater is designed in such a way that it only starts when the water is running. Having this automated system that only ignites the tank when water is running is not only an energy-saver but it also helps prevent overheating. Besides this, it makes it super easy to use in areas with low electricity of without a grid. It has a safety feature that shuts off the heater it has been on for more than 20 minutes. It will also shut off automatically if the unit gets tilted past 45 degrees. So, there is no risk of starting an electrical disaster if it were to ever fall off. The Eccotemp L10 has an achievable temperature range of 50-140 degrees Fahrenheit, which is great, even for places with chilly and unpleasant weather. The setting up? That is simply a breeze. The box includes all the accessories and fittings you will be needing to get your heater installed and ready to go. As with the plumbing, the design is also fit for most plumbing applications. It includes the standard half-inch fittings and it is super easy to embed on standard fixtures. The Camp Chef is our budget option if you want to save some bucks. It is made of still and it boasts of quality that delivers for your satisfaction. The truth is that this rather versatile water heater continues to get good reviews from happy customers, so it is well worth a look. We absolutely appreciate the specific details that make this water heater simply exceptional. The heater itself has this shower head that was probably intended for home use only but we do not see why not to use it in your RV. We also love the versatility and flexibility of this water heater. Users have been complaining about the battery installation. According to some reviewers, they had to make some adjustments to the battery connectors to get the heater started. These adjustments provide a safer environment for the heater and your RV. Not only does this heater provide hot water on demand with a flow of 1.5 gallons per minute, but it has a fully adjustable water and heat flow. The 2 “D” batteries it uses to start allow it to operate as an automatic on-demand product, reducing energy waste and risk of overheating. On the front of the heater, you see the water valve, which is used to make adjustments to the water’s flow. One interesting feature of this great heater is that the box includes a showerhead with four different settings – off, mist, shower, and jet. It includes an 8-foot water hose. Installation? A total breeze. The intelligent design of the Camp Chef HWD5 Triton Water Heater allows it to stand alone on installation or it can also be used as a hangable. Either way, the heater will still provide optimal performance when you need it. If you decide to bring down the heater, it gets more comfortable. The heater includes a carrying handle which also allows you to put it away properly. In order for this heater to work at its fullest, it must work with a minimum required pressure of 25-30 psi. To operate at its full, the pressure in the pipes should be at least 80 psi. This heater connects from any standard hose and begins to heat as soon as it is started. Once the water flow stops, so does this 20-lb propane heater. The Triton is a complete warrior when it comes to withstanding harsh weather. You can perfectly hang it outside your RV too, and heat up your water supply steadily and with no changes in flow. There are so many things to be said about the Camplux 5L but one of the things that really make this one stand out is its portability, which sets it apart from the rest. Highly recommendable, this heater is not in the business of letting you down. We have so many good things to say about this product and we will start with the price. Given all the amazing features it has for the price; this is definitively a bang for the buck. It is so easy to set up and comes with a showerhead. All you have to do is basically connect to a hose and turn on. The heater has the normal limitations you would expect from any regular water heater. But one thing that really threw us down is that it is a bit difficult to give it maintenance. It does not have a draining outlet system, which you would use to evacuate the system after use. However, this should not be a problem since it still holds the standard for a not-so-difficult maintenance. This portable propane powered water heater is easy to set up and can be carried independently everywhere. Not only is it easy to use but it also operates with the minimum amount of energy. When it comes to water pressure, this water heater operates at an impressive 2.5 psi. It delivers a maximum flow of 1.32 GPM at 46.4℉（8℃), the maximums temperature it reaches is 114.8℉ (46℃). This is not bad at all for an inexpensive water heater. If you love to travel outdoors on the road a lot, this is the water heater you need. It is super convenient in conditions and places where water might get scarce as it is great to save water. The compact size with a foldable handle of this heater allows it to be placed pretty much anywhere. The brass-finished regulator features two knobs, one controls the flow rate and the other is designed to control the heat. This is super convenient as you get the chance to independently control the water flow rate to get just the right temperature you want. When it comes to safety, Camplux has included several features to avoid over-heating. This includes a flame failure device, anti-freezing protection, and an oxygen-depletion shut-off protection. You can place this heater outdoors and not have to worry about it. It works with propane so you will not have to worry about connecting it to your RV battery. So, you get a compact, convenient, and portable heater that operates with minimum energy requirements. It requires 2 D batteries to get it started. The setup is an absolute breeze. Only a few steps and you will get your warm water in your shower. Versatile and highly durable, this 10.8-lb great water heater will run on for 180 days with its two batteries for ignition. The EZ 101 water heater is as portable as it is convenient. Its sleek design, great performance, and great prices make it deserving of a spot in our list. But there is more than meets the eye. When we look at this water heater, we notice the sleek design and it is relatively easy to install, especially if you already have a gas pipe already in place. We consider this water heater a great value for the money. It delivers impressively if you take good care of it. We are sure you will enjoy this heater, how easy it is to install and to use. Did we mention it also includes a shower head? The heater is all great but it is not necessarily king when it comes to resilience. If you place it in a very cold environment, like outdoors in a very chilly camping night, you might risk it freezing and rendering it inoperable. But the risks are actually slight. Plus, if you are planning on installing this in your RV, the risk of it freezing to extremely cold temperature is pretty much null. You can easily adjust the temperature and water flow. Its built-in DC electric ignition system provides a thermal efficiency of 85%, which is pretty decent. This device also works automatically, which is super convenient energy-saving-wise. This water heater does a decent job at giving you warm water during the winter and nice water during summer. It is very convenient as it can operate with both LPG and propane, broadening the options, which is nice. One thing that we are sure you will love about this water heater is the super convenient knobs. One allows you to control water flow and the other controls temperature. Of course, remember that the temperature will be affected by the water flow. The unit is safe to use both indoors and outdoors. Since you will probably be using it in your RV, you will mostly use it indoors. In that case, we recommend you to duct away the gas exhaust. The owner’s manual will guide you through a safe explanation, which is pretty easy. The flow rate of the EZ 101 will depend on several factors and this is something you must keep in mind. Officially, it delivers 1.6 GPM. Mainly, if you dial it up for really hot water (say 120 degrees F), then the flow will automatically be reduced. So, we can say that the real flow delivered is something between 1-2 GPM. Still, it has been upgraded to deliver a great flow at a pretty good temperature. The EZ 101 also allows you to control the flame of the burner and the specific number of burners that you can use to heat the water. Its 20-minute timer prevents the building of CO2 in your RV as it will automatically shut down. The Marey gas water heater is there to provide you with endless hot water only when you needed. When not in use, it will save you gas and electricity. Do you need to save in electricity bills? This is the water heater for you. We like how the safety feature protects for overheating but it also features an anti-freezing system for whenever you meet extremely cold temperatures. The design is compact, a bit heavy perhaps, but this does not really affect the ease of installation. The fact that you can fire it up at 8 psi is pretty great. The way this heater delivers waters places it in the category of heavy duty. So, you got yourself a versatile and highly durable product. We found that controlling the temperature using the faucet is quite difficult. But then it is not that hard to operate and you get an amazing performance. Of course, it comes in a compact design that helps save space and it is easy to install anywhere. When installed in your RV, you will not have to worry about using up your battery since this one does not require electricity. Just easily install it and put it to good use. One of the things that we consider impressive about the Marey Gas 10L is that it has the ability of heating an unlimited amount of water, based on your demand, of course. This is an almost unlimited amount of water but still with the protection of a timer that avoids overheating. With intuitive regulators, you can control the flow rate and the temperature at which you want your water by controlling the amount of gas. As you ride on your RV, you will see no more need of a constant power supply as this heater works completely with gas. This heater can easily be regarded as a heavy duty, especially given that it can provide a flow of 3.1 GPM. So you are getting a sufficient supply of hot water for the entire family. Given the ability of this heater, the amount of water it heats, and the required power for this, you can easily be saving yourself about 60% of electricity. This is actually great news if you are riding on an RV. As for safety, it shuts off immediately if the flame goes off for any reason. It also features an anti-freezing protection feature that prevents the water inside the pipes from freezing, which would be a serious issue in extreme temperatures. The start-up system, powered with 2 D batteries, is low-pressure so it can operate even if the pressure is 8 psi. These batteries will last for a very long time and you will be saving thick bills from gas and electricity. This gas water heater by Excel will put a big smile on your face, thanks to its super performance, versatility, and power. It runs on LPG or propane, with an exclusive vent-free technology, and with a lifetime warranty. The first thing that we find great about this heater is that it can start and operate at 2 psi and a maximum of 120 psi. So, there is no need for a pressurizer pump, which makes this heater a great value for the money. Of course, there is also the stylish design which makes a nice addition to any bathroom. It is lightweight and easy to install. You can tell you save money not only in features, parts, and installation but also in water and energy saving. There is pretty much nothing to dislike about this water heater from Excel. Yes, there definitively is an owner’s manual but instructions might be confusing. However, installation is done easily and there is hardly anything you could do to break it. Another thing that might be a drawback for some is that the manufacturer does not recommend more than one point of use at a time. But this will only be a disadvantage if you use it somewhere else other than an RV. This water heater is suitable for you if you are looking for a versatile heater that you can switch from your RV to your home, or to the field. With such a wide range of uses, you can rest assured that you have a quality product worth every penny. You will enjoy the satisfaction of using power and water only when it is needed. This heater effectively turns off water and gas supply when not in use. Are you short on water and do not get enough pressure on your pipes? This usually requires you to get a pressurizer pump. That, if you want to kick-start your heater. Not with the Excel. This unit will fire up with a pressure of only 2 psi. This powerful heater has a pure copper heat exchanger, which guarantees an effective distribution of heat. As a gas regulator, it features an LPG flare brass adaptor. In the end, you get a steady supply of hot water the minute you open the water. We particularly enjoy the lavishing look of this one. It will be a nice touch on your RV shower. Not only is this design aesthetically appealing but it is also distinctive and simplistic, which is nice. As a vent-free appliance, you will not need to make a vent for fumes to be released. This means that you will save money as you will not need to make any costly maintenance process and you will not have to deal with emissions. This heater works great at handling lower temperatures as it will effectively adjust the flame to the temperature you desire. This is a hard worker. Remember that it can lift up your heat even at a pressure of 2 psi (and a maximum of 120 psi). This is great news for RV drivers, given that water there usually flows at a rather low pressure. The installation of this unit is also an absolute breeze. You will very quickly have this beautifully designed unit up and running delivering hot water almost instantly. If you notice, this helps you save water. You do not need any special plumbing skills to put up this one. There is no need for installation of ductwork and flues. The heater operates safely thanks to its Oxygen Depletion Safety shutoff. This means that the unit will shut off if the flame goes off. So here you have a device built to save you energy, water, and materials cost. You get a steady and safe flow of hot water that can be easily controlled with the stylish control knobs. What is the best RV Water heater? From our exhaustive list, we are going to go with the Eccotemp L10 Portable Tankless Water Heater. Check out all the features detailed and you will see why we make it our best choice. Do RVs Have tankless water heaters? By default, RVs water heaters included a tank of water that is usually about 6 gallons. If you want to have a tankless water heater, you will probably have to buy one and install it. What is better electric or gas water heaters for RV? As we have mentioned before, there are several conditions that factor into deciding which is the best one. Electric heaters will take up power from the RV battery, while gas water heaters will not. When it comes to maintenance, the electric ones rule. You have to take care of emissions for the gas water heaters. Natural gas heaters are usually bigger and more complicated to install, so the other two options become RV users’ favorite. Do Travel Trailers have water heaters? There is really no reason for them not to have. A travel trailer is also a type of recreational vehicle, with kitchenette, toilet, and shower so they should include a water tank with a heater. Still on the fence on what you should buy? No issue. Let us quickly guide you through all the things that you must consider before hitting the store to get your tankless water heater. The first decision you need to make is the type of heater you need based on the power source. You basically have three possible sources of power for a tankless water heater: natural gas, propane, and electricity. Electric heaters are low maintenance while gas and propane need to be cleaned frequently. The electric type typically costs more than its gas equivalent. Also, note that most RV users prefer electric and propane because they are more portable. Electric ones have to be integrated every time. You should also consider that the electric ones are eco-friendlier because they produce no emissions at all. Certainly, tankless water heaters are more efficient than the conventional ones. However, within all the tankless, some of them are more efficient than others. Differences might be small but they add up in the long run. Verify that the heater you are about to purchase has an Energy Star certification. Needless to say, space is important in your RV. So, make sure that the dimensions of the heater will not take half of your space. Find out if your RV has enough space for you to install a water heater. If you are purchasing online, the dimensions of the device are specified in the description. Do not take this for granted as you do not want to wind up with a heater that is too big for any space you designated for it. Make sure that the chosen location is comfortable enough for you to easily make the connection to your RV. Also, consider a water heater with an easy design and interface. This will make it easier for other people in your RV to operate it with no hassle. The flow rate refers to the volume of water a water heater can deliver per unit time. In the specifications, you will find it in gallons per minute (GPM). Now, your call should not only be determined by how fast a faucet drops a lot of water but also on the amount of water. There are units that are great for an entire household, for instance, allowing the use of several applications at the same time. On the other hand, there are heaters who are smaller and can only deliver a flow rate of 0.5 gallons per minute. Now, the best flow for a family that uses a heater for the shower exclusively, will do well with one that supplies 2 to 2.5 GPM. It will all depend on the availability of water and any special need or taste of all the members of the family, or riders of the RV. Since we mention water availability, there might be situations in which this is not necessarily abundant, so do consider that too. Very importantly, have an estimate of your average water consumption within a time frame. This information will give you a rough idea of the size of heater you need. In average, a household RV needs 1 to 3 gallons of water every minute. Then you have the toilet and bathtub, which take 3-4 gallons every minute each. Consider how frequently these appliances will be used when choosing the ideal tankless water heater. This usually is the most important factor in consideration when it comes to choosing a water heater. As you noticed in our list, we went for the most affordable ones. If you feel like you can crank up your budget a little bit, then you can go for those who are in the $500-$1000 range. Some others that are higher quality are even more expensive. Note that this price does not include professional installation, which you might want to hire for higher-end devices. Add all that and consider what are you willing to spend. As the name suggests, this refers to how good a device is at heating. This is measured in BTU (British Thermal Unit) and pretty much all units have this specification. It is important to factor in BTU when deciding what heater is the most convenient to you. The higher the BTU the faster a heater will heat the water it goes through. This means that you should consider the places you will be visiting with your RV. This is because groundwater temperature differs from location. Consider also that some units might fail when groundwater is too cold. Some units will have heating capacities between 30,000 and 50,000 BTU, which is less than your typical household one. However, do consider that these are tankless heaters that come close to the conventional ones used at homes. So, a heater hovering in the range described above should be good. Most manufacturers focus on creating products that are user-friendly. We recommend one with a digital display as this feature will make it a lot easier to customize operation and monitor levels of temperature and flow rate. There is other useful information such as tank temperature and pressure readings that you will find useful to have at a glance. You can also go for simpler knobs that allow you to control the water flow and the power of the heater to give you exactly what you need at the moment. Try to imagine a heater that is constantly working non-stop. Besides the obvious that it will drain the fuel source, we are talking about a device operating with temperatures that closely approach boiling point. Newer models have an auto-off that makes the heater stop operation after a certain time. When going through specifications, make sure you see what are the safety measures manufacturers have added to their product. But this is not all you have to be looking into. This device should be able to withstand the changes in temperature and the harsh weather of the places you will be visiting. Consider if you will be traveling through rough terrains as well. Make sure it also has other features that protect against voltage spikes and shortages. Even when manufactured by respected corporations, like with any other appliance, water heaters can fail. Make sure you are aware of the warranty, for how long it works, and how to enforce it in the event of your heater failing out of nowhere. So, in other words, ask for the coverage of such warranty. Finding a durable and good water heater should be a no-brainer if know what you are looking for. Knowing what you are looking for implies that you have factored in the conditions of your RV and your needs and those of your family. Always go for the durable on. The one that resists rust and is made of premium quality. Pick one that will need the least maintenance in a certain period of time. Ultimately, you will realize that the best water heater is the one that will provide a great value for your money. This is the one that keeps operating non-stop for many years and with little maintenance. We can only hope that you have effectively considered all the details we have mentioned throughout this article. Here’s to a top water-heating experience.